My Father’s House just celebrated our 5 year anniversary!!! To celebrate the boys planned a SOCCER TOURNAMENT. They selected 3 different teams to organize a “BEST OUT OF 3” Tournament. Of course they are all friends. This was more for fun, than competition, though I know our boys, and for sure they ALL wanted to win!! The College Team, the Highschool Team, and the Hope of Praise Team, were the 3 teams, in the tournament. Looking at the college team, and the fact they did not do so well, has led me to believe that they had a couple of weaker players who may have handicapped them … haha!! I will let you look at the photo then you can tell me who you think that could be. I know that Peter Flomo is an “all-star” player, so for sure he was strong for the team. Momo Bai scored the only goal in their second game against the winning team, Hope of Praise, so definitely Momo, too is an outstanding soccer star. COLLEGE TEAM ……. you are good sports!! I am told that Daniel Keamue and Adolphus Tweh were most outstanding in the first game against the highschool team. You both scored from your half, best goals in the tournament!!! Full time ended 3-3 and the victory was won in a draw. Sorry you lost 6 – 5. Next time, you will have a come back. College Team is out for fun, if they do not win, it will be okay!! Please note our Directors Aaron Paul and Malcolm Harris are part of this team. THE HIGHSCHOOL TEAM is ready!!!! They worked hard to beat the College Team, in a 6-5 victory!! We proudly announce that the MVP award for the whole tournament went to FRANCIS DARLIEH, one of our Gr. 12 students. He is in the photo below, back row, second from the right, wearing a red shirt, with his hands forming a prayer!! Aha, that is why he did so well!! He prayed!!! We are all very proud of you Francis for your most outstanding performance throughout this tournament!!!! Wow!! Good Job Boys, you did well!! Photo below shows the excitement of winning!!!!! HIGHSCHOOL TEAM wins 6-5 over the COLLEGE TEAM!!!! Great Victory!!! 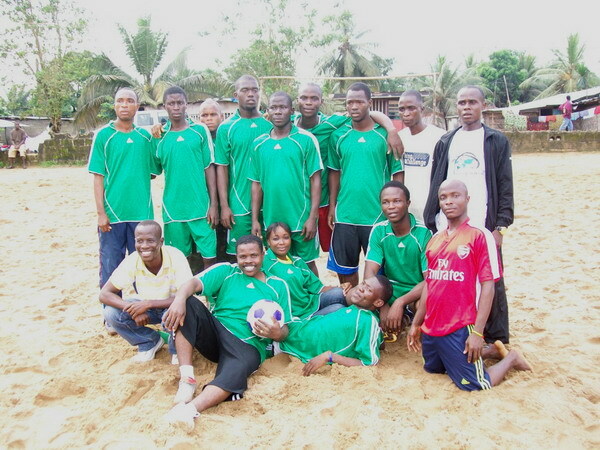 The HOPE OF PRAISE SOCCER TEAM was the official winner of the tournament!! Pastor Weah what do you feed your boys? They did well!!! Hope of Praise Team you were amazing!!! You won all your games!! 5 -1 victory over the College Team and 5-4 against the Highschool Team!! Daniel Keamue, in the red shirt, is presenting the Congratulation Award to the Hope of Praise Team. What counts is the fact that EVERYONE HAD FUN!!!! !